Conducting elections in India is a mammoth exercise e, a the numbers involved, of the election functionaries and the electors put together, during any general election are mind-boggling. 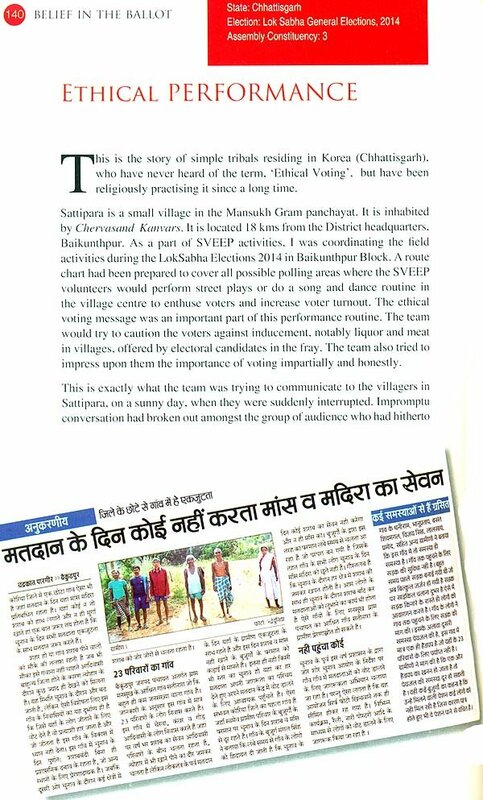 Difficult terrains, different socio-political situations, law and order problem , voter's apathy or lack of awareness, and many other such issues, are tackled by election officials at the grassroots level, with the help and assistance .of the local community. The whole process of the conduct of an election is rolled out with collective will power, and humongous efforts. The entire exercise is conducted in such a timely and smooth manner, that the culminating point of casting a vote at a Polling Station is perceived to be an exceptionally easy task to be accomplished by simply pressing a button. 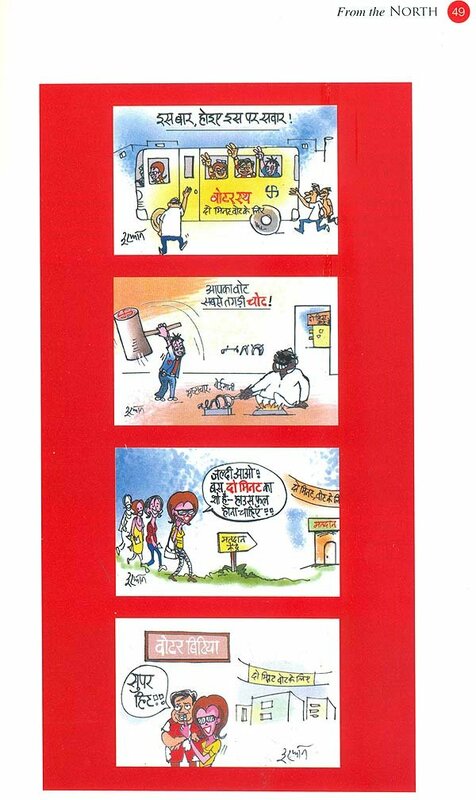 Elections are all about people; about their choices, their dreams and aspirations. The road to democracy in India is paved with stories of millions of people who work behind the scenes and whose determination, grit and bravery have been instrumental in overcoming multiple challenges for ensuring smooth, free and fair conduct of elections. 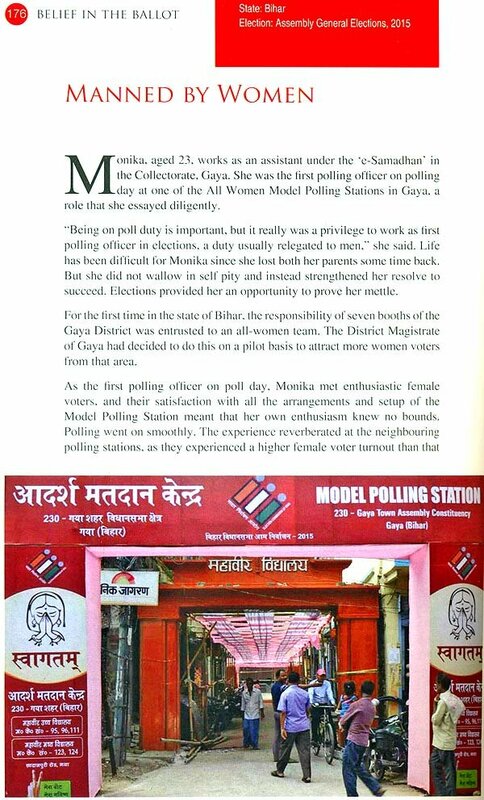 It is my pleasure to note that an effort to recognize their immense contribution has been made by documenting their stories in short narratives; these are human stories, as we prefer to call them, of the faceless, nameless and unsung heroes of the Indian elections. 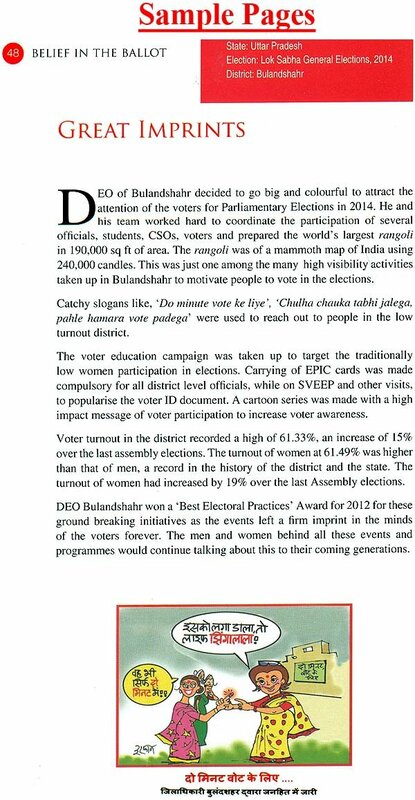 It is heartening to note that the Chief Electoral Officers of almost all the states have contributed to the first volume of these stories. The Publications Division, Mini try of Information and Broadcasting deserve compliments for publishing this first volume in record time. 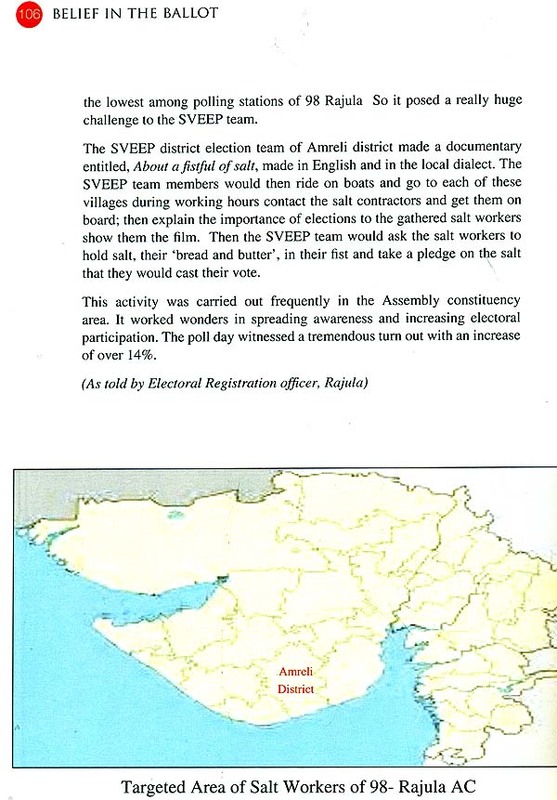 Documenting the efforts of the election officials and voters of this country is not only a social obligation but also a sincere attempt to profile real actors and participants in Indian democracy. This collection of human interest stories would go a long way in inspiring and motivating many more sentinels of Indian democracy. It would also motivate election functionaries to carry on their task of conduct of elections with renewed zest and dedication. I wish this volume all success and dedicate it to the unknown heroes who dedicatedly work behind the scenes for the Indian elections to resoundingly succeed. The Elections in India are testament to the vibrancy of the world's largest democracy. They are a true representation of the spirit of "We, the People", as enshrined in the Preamble of the Constitution. The belief in the ballot is the driving force behind the success of this mammoth exercise and it includes the officials, functionaries, but most importantly the common people who brave all odds to exercise their voting right and celebrate democracy. 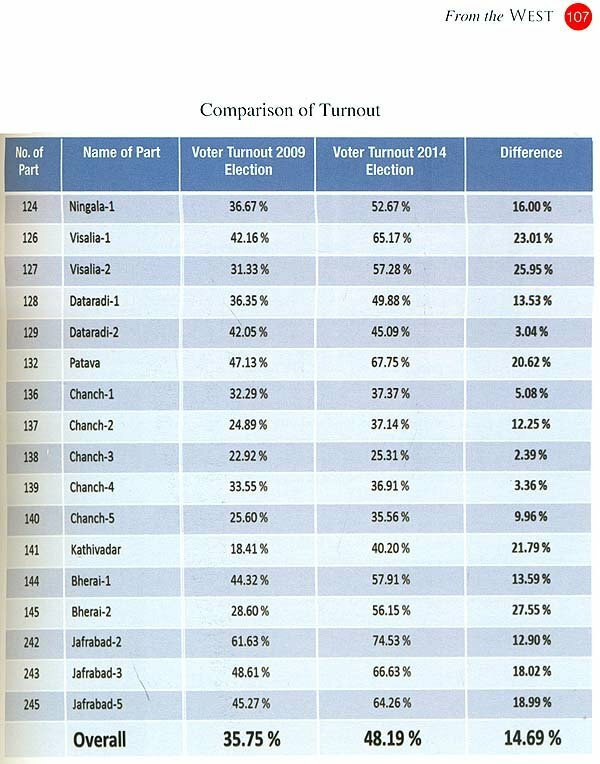 When we talk of elections in India, we talk in terms of millions. For example the 2014 General Elections to the Indian Parliament saw 83.4 million registered voters; 55.4 million voted at 0.94 million Polling Stations with the aid of 6.7 million election personnel (including police personnel). It does not end there. During a General election, while one part of the country may be reeling under temperatures up to 45 degrees Celsius, another would be covered with snow, and yet another part would be lashed with incessant rains. Polling Station locations could be inaccessible, either deep inside a forest, or accessible only by foot or even boats, or at heights above 12,000 feet. This is a country where the geographical, social, cultural, linguistic and ethnic diversity is huge; the immensity and the complexity of organising and conducting elections can be mind-boggling. 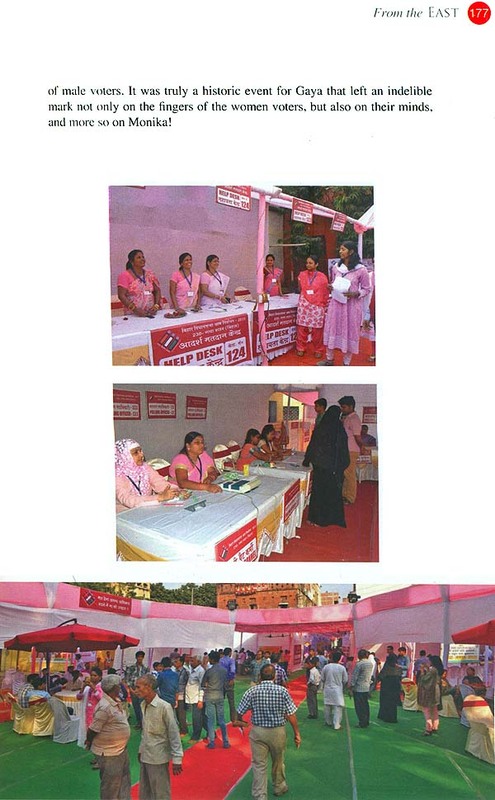 Despite these challenges, elections have been conducted effectively and smoothly. When the whole exercise is so enormous, for an outsider it may be difficult to conceive how it works like clockwork. There is a dedicated set of human resources behind the conduct of smooth, free and fair elections and obviously it would be impossible to know each one of them. These people, the election functionaries are in a league of their own; these are people, who take pride in this national work; who innovate and find solutions; who go beyond the call of duty to uphold the rich traditions of democracy and democratic elections. 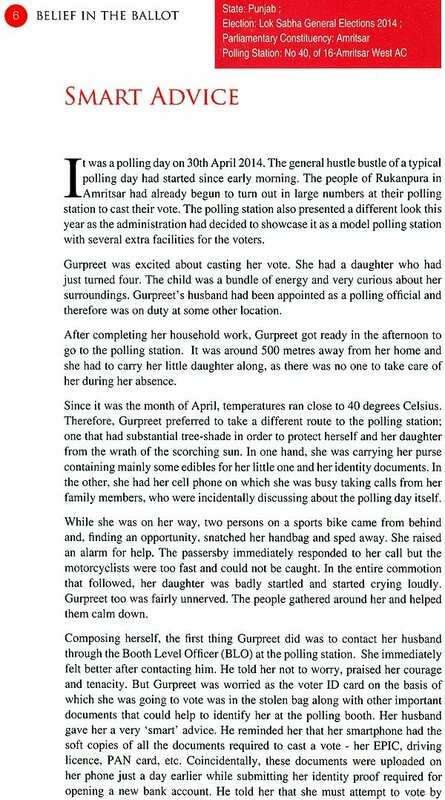 These are people who make personal sacrifices, to the extent of their lives in the call of duty; or people who stand and serve; these are the nameless, faceless and unsung heroes of the Indian elections. These unsung heroes are out there in the field, braving severe weather conditions and extremist activities, toiling day and night to ensure, even with limited availability of resources, that the millions of voters have a pleasant voting experience and political parties and candidates have a level playing field and the principles of the Indian Constitution are upheld in every way. We, as observers, might look at elections as a process in auto mode; that post announcement of polls, everything just falls into place and things begin to happen as per schedule. 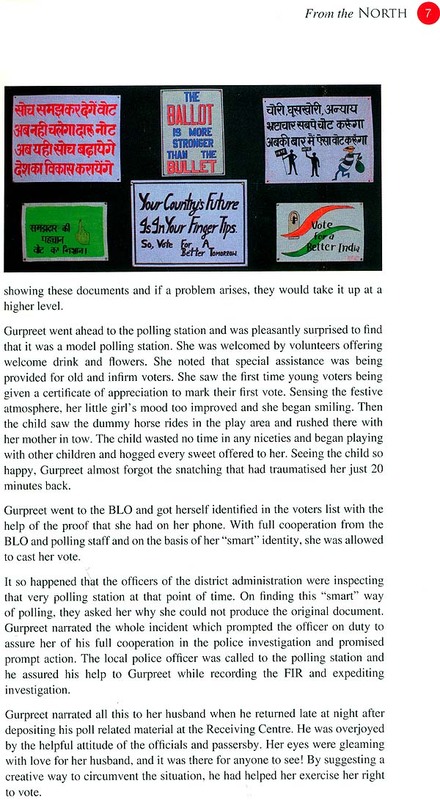 But the truth is that nothing would have worked but for the hard work and focussed energies of our election personnel. 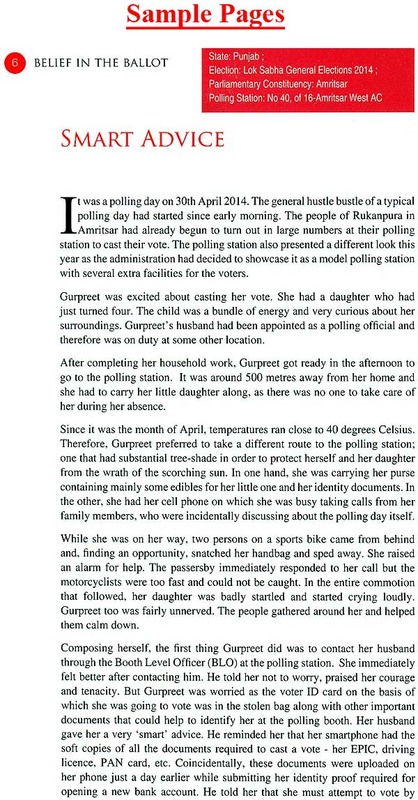 With deep respect and acknowledgement for them, this compilation has attempted to give a glimpse into a part of their lives during elections - lives of pooling personnel, of Returning Officers, of office staff, of security personnel, etc. We cover diverse stories here ranging from personal experience narrations, attack on our teams by Left Wing Extremists, to how entire communities of voters were motivated to register and vote. Then there are the voters, the youth, the CSOs, the media, the government departments, the women, etc. 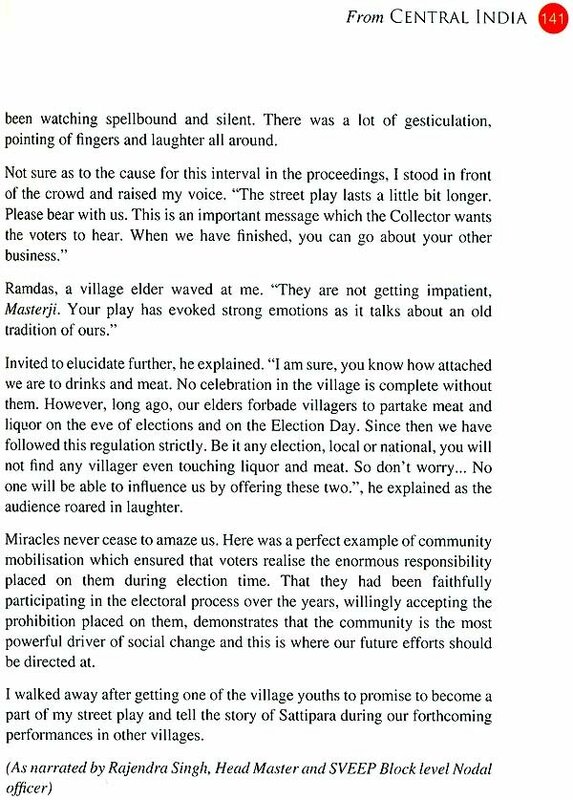 whose enthusiasm for electoral participation is so immense that it ends up being infectious; almost to epidemic levels! These are our partners. 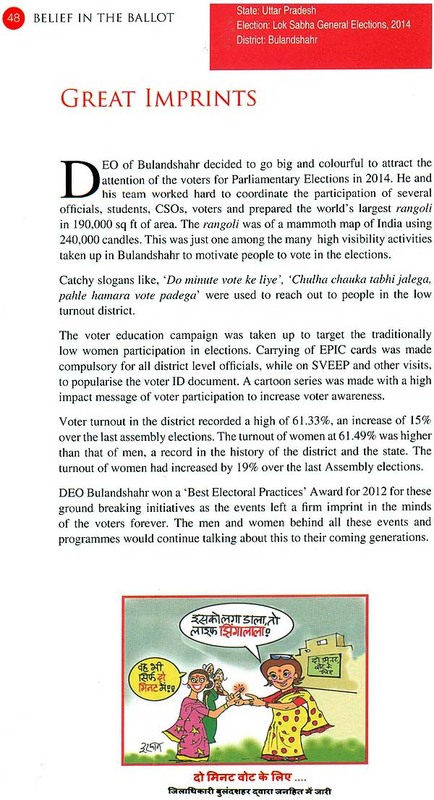 Several thousands, perhaps lakhs of them have supported us in their own small or big way by either casting their votes despite accentuating circumstances; or coming up with a creative way of generating awareness among voters; or helping us disseminate education and information among voters; or simply breaking the long and entrenched, orthodox views on voting rights for women and other excluded communities. These stories are sourced from the states and each story has a different author - some mentioned by name, but there are some stories where the author has preferred not to reveal her/his name. Nothing new about the latter. In government we are taught to remain behind the scenes. Let someone else take the credit. We are fine with that as long as the work at hand gets done. 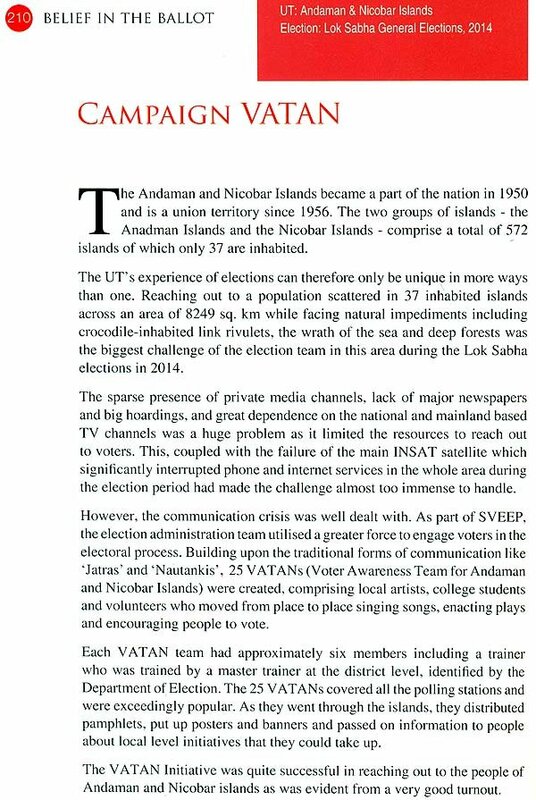 At this juncture I would like to put a disclaimer: these stories do not represent the entire gamut of lives of the election personnel or the entire set of innovative solutions found for voter education and other activities for conducting a poll. This is just a representative sample. And these are short narratives, just enough to maintain your undivided attention. Through this anthology, we present to the reader stories of grit, of sacrifice, of comedy, of hope, of creativity, of enthusiasm, and the diversity of experiences that cumulatively bring the picture of the story of elections in India.